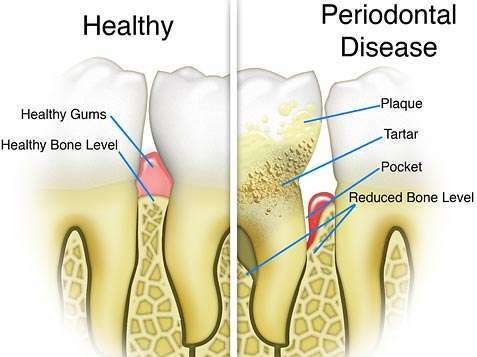 Periodontal disease, also known as gum disease is caused by bacteria buildup from plaque that causes inflammation in the gums. There are several types of gum disease, beginning with the mildest form, gingivitis, and progressing to more severe forms of periodontitis, where bacteria spreads beyond the gum line and damages the gum tissue and supporting bone structure. Periodontal maintenance is necessary for patients who have been treated for some form of periodontal disease and works to prevent the disease from worsening. There are numerous surgical and non-surgical procedures used to treat and maintain periodontal disease in Los Angeles. These treatments, coupled with an excellent oral hygiene routine, and healthy lifestyle habits can aid in reversing the effects of periodontal disease and prevent further damage to gum tissue. Regular brushing: Brush your teeth twice a day to remove food particles and plaque. Brushing your gums is also an important step in removing bacteria from the mouth. Floss your teeth: Brushing alone is not sufficient in removing the plaque buildup between the teeth. Flossing helps to remove food debris left between your teeth and gums even after brushing. Be aware of risk: Factors such as age, smoking and tobacco use, genetics, lifestyle and diet can increase chances of developing periodontal disease. Speak to a dental professional if you believe there is something putting you at a higher risk of developing periodontal disease. Complete an annual CPE: The American Academy of Periodontology recommends an annual Comprehensive Periodontal Evaluation to assesses the health of your teeth and gums. The test examines your teeth, plaque levels, gum health, bite, bone structure and other factors, to determine whether you display symptoms of periodontal disease. Catching these risk factors early on is important in preventing the disease from worsening.